BRICS is intended to change the global situation by peaceful means. For the last year and a half, there have been more and more critical opinions about BRICS. Recently, western media and some Russian academics have stepped up their criticism of BRICS and expressed doubts regarding the association’s prospects. Experts claimed that the Goa Summit would be a routine one, and the Five itself would lose steam, and its influence on the global arena would fizzle. In fact, the leaders of the five countries confirmed their intentions to expand their interaction within BRICS and to promote its further strengthening, especially in the political area, which is of particular significance for Russia given the conflict with the West. 15 years have passed since Terence J. O’Neill coined the abbreviation BRICS to denote the growing markets of particular attraction to investors, and 10 years have passed since a meeting of the Ministers of Foreign Affairs in New York laid the foundations of the eponymous international association of a new type. Right away, the new format was met with animosity and ridicule from the West, including both the academic community and the media serving the interests of the developed countries. For the last year and a half, there have been more and more critical opinions about BRICS. Both media and academics discuss the question of whether BRICS is even still alive. Any Internet search engine will instantly come up with articles on BRICS exhausting its opportunities and getting bogged down in problems. Many articles on the subject were published even after the Goa Summit. The very idea of bringing together such disparate countries is viewed as a weakness of BRICS. They are all at different development levels, they have different political regimes (both democratic and authoritarian), and each country puts its national interests first. Significant attention is being paid to contradictions which do, indeed, exist between these states. First of all, there is a long-standing geopolitical conflict between China and India, which shows no signs of mitigating over time. The economic difficulties of the BRICS countries are also actively discussed, including dropping economic growth rates (it should be noted that India is the only state that demonstrates a relatively stable growth). The opponents of BRICS also focus on the fact that the member states have different relations with the US and Western Europe. Russia is a rogue state (let’s not comment on that statement). China is an unwelcome competitor which threatens the US hegemony and must therefore be weakened. India is a new power that strives to establish contacts with the West. The West, in its turn, is also flirting with India. After the change of government Brazil seems to have taken “the right path,” but it remains economically troubled. As regards South Africa, given its domestic problems, it should not be considered as a full-fledged actor in the global geopolitics. Delving into differences in the political strategies of BRICS countries, the association’s opponents emphasize the fact that the BRICS states do not demonstrate a united foreign policy front. For instance, they do not always vote together on important issues in the UN Security Council, and China does not entirely welcome India, Brazil, and South Africa’s desire to become permanent members of the Security Council. Yet political reality tells us different. Recently, the US and the West, without making an open declaration to that effect, have been taking BRICS seriously, which is proved by the fact that they actively try to subvert the association (in this regard it is worth asking the question whether Dilma Rousseff’s resignation might be a link in this chain). Why don’t the western countries acknowledge BRICS as their rival? First, it would be too great an honor. Second, why alert an enemy coalition that threatens the US hegemony (it applies primarily to Russia and China)? It was against this background that fears concerning India’s presidency in BRICS abounded. It was claimed this presidency would lead to the association’s stagnation, that nothing radically new and important would happen during India’s year, that the Goa Summit would be essentially a technicality. Initially, India was not particularly efficient either, which was taken as proof of its unwillingness to contradict the US. This was the opinion of western political scientists and experts and also of many western-oriented liberal academics in Russia. Yet the results of the summit proved unexpectedly positive even when compared with the optimistic predictions. Essentially, at the time when a poly-centric world is emerging, the political leaders of the BRICS countries and members of their elites, having somewhat broken the passive attitude of their bureaucracies, gave a powerful impetus to the association as the bearer of a non-western concept of the international relations structure. The Goa Declaration became an unpleasant surprise for the west. Having pushed back real contradictions between the BRICS countries, their leaders succeeded in formulating a unified stance on several crucial issues, aimed against the US dominance. Despite the expectations of those who call BRICS an exclusively economic association, the agenda was dominated by security issues, resolving conflicts and developing joint approaches to crises and challenges, by global regulation of strategic stability. The subject of fighting the common enemy, international terrorism, was one of the focal topics at the Goa summit, but not everyone was satisfied with the results of the discussions. For instance, India would have liked to see a more decisive condemnation of state-sponsored terrorism. It was of crucial importance for Russia to receive the BRICS states’ support on the Syrian question. Referring to the appropriate UN resolutions, the BRICS leaders supported Russia and called for an “unrelenting fight” against the groups the UN recognized as terrorist, such as Islamic State and Jabhat al-Nusra. Thus the US failed in its attempts to pit other BRICS states against Russia on the Syrian issue. Of significant importance is also the unified stance the five countries’ leaders took on the situation in North Africa (Libya) and Afghanistan and other hotbeds of unrest. Sergei Ryabkov, Russia’s BRICS Sherpa, noted that the Summit’s instruments recorded a large number of topics which are important for Russia, such as the peaceful uses of outer space, drafting the Convention prohibiting chemical and biological terrorism; BRICS also supported the statement that “unilateral sanctions are inadmissible”. Gradual expansion of the BRICS agenda is very important for Russia. At a time when the economic growth has slowed down and not all the BRICS countries are capable of overcoming the consequences of the recession, it is important to tackle social and sustainable development issues, and BRICS could play an innovative role in the process. Ministerial conferences and expert consultations, including civil society consults initiated by Russia, preceded the summit and they will also follow it; all in all, they will be held in over 30 areas. Particular mention should be made of the BRICS Think Tank Council (BTTC) which brings together BRICS strategic centers in Brazil, Russia, India, China, and South Africa. Expert recommendations drafted at the scheduled meeting of the Goa BRICS Academic Forum in September were brought to the attention of the heads of state. What changes did take place in a little over a year between Russia’s and India’s summits? First, the New Development Bank BRICS (NDB BRICS) was launched. The bank invested in the first “clean energy” projects in the member states, one project per state. In Russia, this is the construction of a hydroelectric power plant in Karelia. The first year of NDB’s work was deemed a success by the BRICS leaders. Discussing the BRICS bank strategy, President Vladimir Putin noted that “it is necessary to define the geographical and sectoral priorities, and then it is necessary to start developing criteria for admitting new members to the bank and to set down the principal parameters of its investment portfolio.” Special mention was made of the transition to mutual payments in national currencies (a positive development) and of issuing yuan-denominated securities. Plans for the nearest future include similar steps for securities denominated in rupees and in rubles. The launching of a currency reserves pool offers a mechanism for more efficiently protecting currencies from financial markets’ volatility. Starting in February, the central banks of the BRICS countries opened correspondent accounts in national currencies. This undoubtedly undermines the US hegemony and provokes fierce indignation and resistance on the part of the US. The Goa summit discussed the issues of energy, trade, bank interaction, agriculture, the use of outer space and other “common spaces,” healthcare, education, developing humanitarian ties and tourism, fighting poverty and social inequality. Besides the Declaration, several sectoral agreements were signed. Some experts believe the BRICS is under the threat of the “Gargantua syndrome,” i.e. the desire to bite off too much. The declarations probably could have been more laconic, but the five countries’ desire to establish multilateral cooperation in a large number of diverse areas is an objective necessity, even if the range of the issues tackled by BRICS should be defined more clearly. An ambitious new project is the joint exploitation of the Klyuchevskoe gold deposit in the Trans-Baikal region. Expected investments are about 400–500 million dollars (producing about 6.5 tons of gold a year). 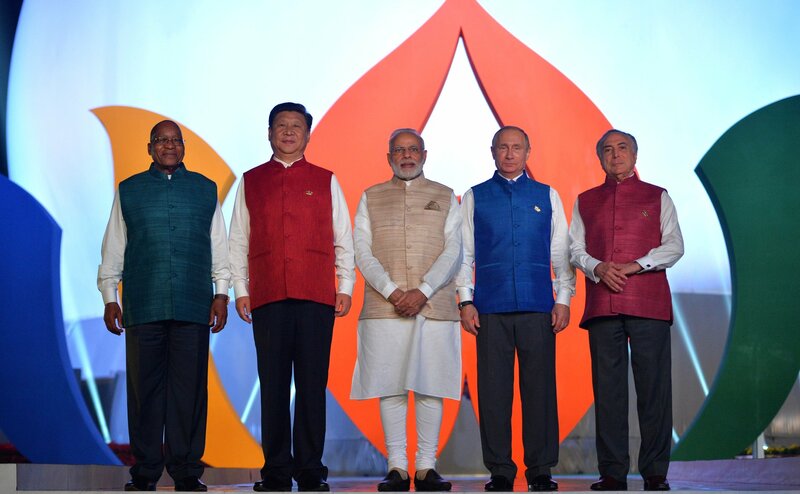 The leaders of the BRICS countries also held bilateral meetings. Thus, Russia and India alone signed 18 agreements on joint activities in various areas, including selling S-400 missile systems to India and joint manufacture of multipurpose helicopters. The parameters of constructing units 5 and 6 of Kudankulam Nuclear Power Plant were agreed upon. Besides, Russia and India agreed to launch a joint investment fund of 1 billion dollars. The leaders of the Bay of Bengal Initiative for Multi-Sectoral Technical and Economic Cooperation  were invited to join the discussion. These countries (with the exception of India) have not thus far been a priority of Russia’s foreign policy and economy, and their participation in the summit became an opportunity for Moscow to enhance and strengthen its relations with these states. The summit has shown that BRICS remains a union of the world order reformers, and this drive has not slackened off, despite objective difficulties (the “enemies” were probably disappointed that Brazil had supported this course, when it was predicted that Brazil might even leave the group). Interaction between the five countries is based on common interests: they all want to change the global architecture in such a way that would allow the BRICS countries to take their rightful place therein (the IMF quotas is but one odious example of discrimination against the BRICS countries). It does not matter if it is a “mercenary friendship,” with each partner viewing BRICS as a “transit vehicle” that will help them increase their influence in the global governance. The West and the US impose their agenda on the global governance institutions in their quest to preserve their global dominance. Although G20 was conceived as a sort of a global government, it is still dominated by G7, a narrow group of the elect, which makes all the important international decisions and could be said to govern the world. BRICS is not attempting to break down the current world order and it does not subscribe to revolutionary methods of destroying the existing institutions. Yet the largest rising powers speak against the West monopolizing the right to formulate and interpret the rules and the procedures for following the rules. It is important to note that the BRICS countries unfailingly emphasize the need to interact with the international institutions, acting as a united front as far as it is possible. The Goa Summit discussed, in particular, the importance of following the general trade rules set by the WTO, although it is quite clear that the steps the US takes to establish the Trans-Pacific and the Trans-Atlantic partnerships and to conclude agreements on trading in services effectively adjust world-wide regimes to suit the interests of the US and isolate the “undesirables” such as China and Russia. The US, however, is not entirely successful in its efforts. As a project of the developing countries’ political elites, BRICS is intended to change the global situation by peaceful means. This is a first in the history of civilization; previously, geopolitical conflicts were resolved only through wars. Yet World War III would be a disaster for the entire humankind. As BRICS sees the opposition to its proposals for correcting the global governance architecture as it was shaped after World War II and the collapse of the USSR, the association uses the tactics of creating its own alternative institutions, a “parallel international governance.” It is mandated by the countries’ own interests, although many interpret this stance as a warning shot at the “monopolists.” True, things do not go entirely smoothly in BRICS institutionalization, the member countries are justifiably wary of establishing any supranational bodies, which is particularly unacceptable for China. In particular, the initiative proposed by Indian academics to establish a BRICS Joint Research Center which would engage in developing the BRICS strategy has not yet found sufficient support. It would be best to establish this center under the NDB’s auspices, but that would require obtaining consent of the bank’s stakeholders. Yet such a coordinating body engaged in goal-setting and drafting the BRICS development strategy is clearly necessary. Yet thus far, bureaucratic inertia has stood in the way of obtaining expert approval for proposals on BRICS development and joint international actions to be submitted to the BRICS heads of state. Even today, the field of information and academic assessment is filled with debates. After each summit, some media predict that BRICS will soon meet its inevitable demise. Yet, paraphrasing the old adage, the biased media bark, but the BRICS caravan moves on. It is moving slowly, but it is progressing toward consolidation, not away from it, like the EU. If one wishes, one can always find weaknesses and drawbacks in BRICS’ activities, yet we do not sufficiently counter the information warfare waged against the association. It is necessary to conduct our own campaign explaining the significance and tasks of BRICS. For Russia, BRICS is one of the most promising foreign economic initiatives since Russia has been ostracized by the West. Due to decreased contacts with the West, BRICS offers Russia’s political and business circles an alternative opportunity to expand their international ties. It is important for Russia to step up the process of institutionalizing BRICS. It appears that this process will proceed from bottom to top, and not from top to bottom, starting at the sectoral level (for instance, there are discussions of founding an Energy Association, a Transportation Research Center). Given that some claim that BRICS is a Russian project, Russia should proceed with reasonable flexibility.